Role playing campaigns are complex things. You don’t have one protagonist, you have four, five, or even more. You have entire worlds, and planes of existence to explore. There’s a lot going on, and you as the DM need to keep track of it all, and keep things consistent. Forgetting that a bad guy dies twenty sessions ago, and bringing him back only for your players to point it out is awfully embarrassing. Here are some tips I have for preparing yourself for a long form story campaign. It’s hard to predict where you campaign is going to go. You don’t know what’s going to happen when your players start interacting with your finely crafted world, and characters. Don’t try and plan out every little detail, just try and work out the main plot points you want to hit. If you want your players to save the town from the corrupt mayor, then head to the castle to kill the daemon that controlled him, then head to the nearest city to warn the king of a coming daemonic invasion, that’s all you really need to steer the story in the right direction. What happens between those points can flow a bit more freely, and be influenced by the player’s actions. Sometimes you have amazing adventures lodged inside your mind that are just dying to get out and be enjoyed by others. These ideas are usually where I start when thinking about a campaign I want to run. Sometimes, however, the ideas can be too large, and players might get fatigued before they’ve even got to the epic dragon fight at the celestial portal. Some stories are just too long to try and play out in one continuous adventure. Instead take that awesome story arc you had and break it up into smaller digestible portions. You can use acts or chapters, both are fine, but what’s important is you your beginning, middle, and end, into three littler versions of the same flow. 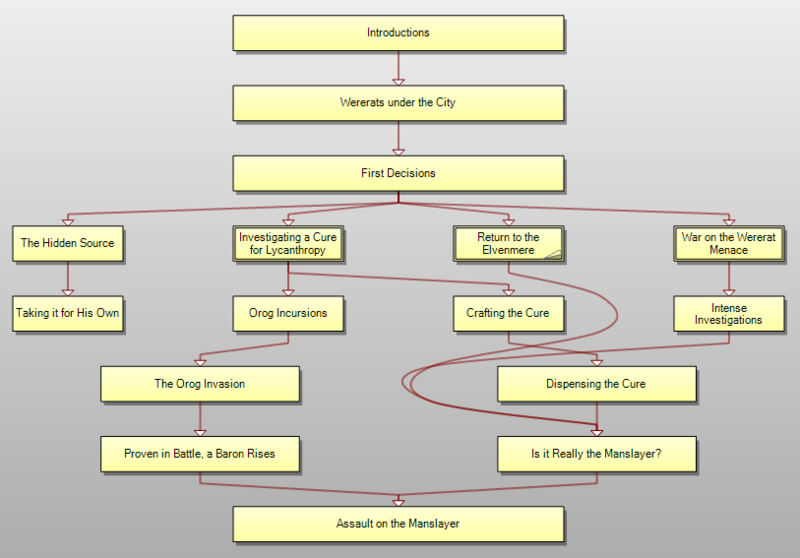 I divide my campaigns into chapters. Each chapter has a beginning, middle, and end, but the story feeds into the next one. Each chapter is around six play sessions. If you’re running a bi-weekly campaign, that means it will take three months for your party to complete a chapter of your story. This gives you a more modular approach to running your sessions, and allows for breaks at the end of chapters to let people dwell on what’s happened, or recover from dungeoneering fatigue. This step comes quite like in the campaign preparation. Once I have built my rough story idea, and divided it up into manageable acts, I take the player’s characters and inject elements of their backstory into the narrative flow. What this means is I add elements that relate to the characters, and put them in the player’s path so they feel like they are part of this larger world. It’s a great immersive tool, and it makes players feel really cool, and special. As an example, if a player has a background where they work for a guild, but they stole something important from the coffers and fled, during the campaign, agents of the guild will turn up to harass the players and try to get the stolen item back. This could lead to the players going on a quest to confront the guild directly, which could lead to a great side mission further along. It could also provide the campaign with an additional nemesis in the form the guild leader. This is easier to do than you might think, in fact, the D&D Player’s Handbook has some great tables to help roll backgrounds for characters that are easily drawn from when it comes to campaign writing. If you’re the kind of DM that creates entirely original worlds for your players to explore, then this point is fairly irrelevant. If you’re a DM, however, that likes to run games in pre-existing worlds, and there’s many out there to choose from, then perhaps you don’t do much world building. You might like to rely on the information in the source books to flesh out your world. This is a totally fine approach, and I have done it myself a few times just because I wanted to run a quick campaign or a one-shot. If you’re doing a long form campaign though, I would implore you to try and do some world building even if you’re using a popular, and well fleshed out setting like Forgotten Realms. Take elements that exist that you want to use and tweak them slightly; Describe buildings or parts of locations that aren’t covered already in descriptions; Rename things, and add your own layers of depth to them. Doing these kinds of things will help make your campaign feel personal, and unique, even if it’s set somewhere players could be very familiar with. You can even go as far as to set your campaign in a pre-existing world, and then add entirely new locations, towns, and characters on top of the basic background. This attention to detail really pays off and you’re far more likely to remember details about places you came up with, as opposed to ones you read in a source book a few weeks ago. As one more additional tip, which I learned from the incredibly talented DM, Matthew Colville, have a list of twenty or so random NPC names stuck to your DM screen so when the players stumble upon characters you didn’t expect you can instantly give them an identity for the players to remember. I didn’t do this for the longest time, and once I learned about it, boy does it make a hell of a difference. That’s all I have for you this week. 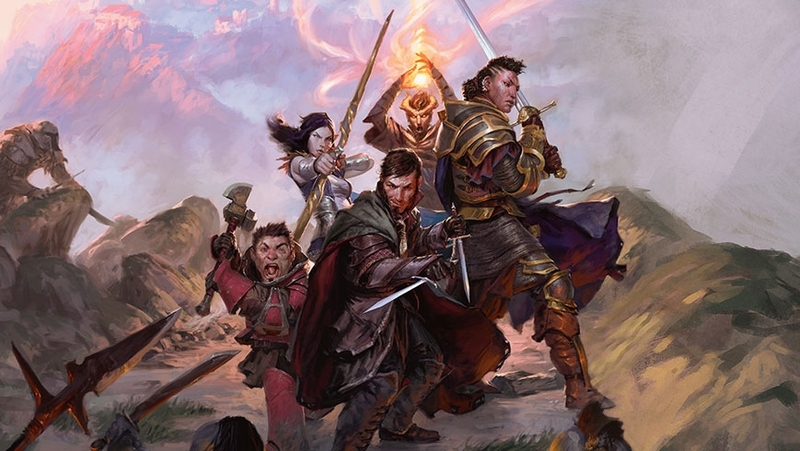 I hope for you eager new DM’s out there this was a helpful read. If not I hope you found this insight into how I run campaigns at least vaguely interesting. Until next time, have a great week.